Following months of protests, and a prolonged sit-in outside the military headquarters in Khartoum, Sudanese president Omar al-Bashir was placed under house arrest on April 11 as the country's military prepared for a transitional government. Many have described the Sudanese uprising as a "bread protest" against a rise in inflation. In fact the Sudanese people took to the streets for much more than a struggling economy, or the price of bread. They have been calling for freedom, peace, justice and the downfall of the regime. The generation leading the uprising was born and raised during al-Bashir's 30-year rule. The protesters are mostly young professionals who have been directly affected by the regime's Islamisation and Arabisation policies. These policies have been particularly harsh against women's freedoms and rights, which explains why young Sudanese women are at the heart of the uprising. The policies have also resulted in multiple years of conflict and insecurity in Darfur, South Kordofan, and the Blue Nile. Sudan's governing system has already deteriorated because of years of state autocracy, nepotism, corruption and violent conflict. Al-Bashir's removal may bring down the state if a strong successor isn't positioned to replace him. 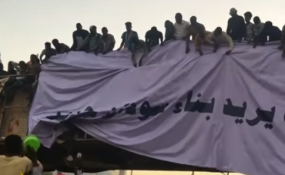 But in my view, given how Sudan has historically been run, the democratic preferences of many young protesters is unlikely to come to fruition. Their expectations for a functioning democracy, with free and fair elections, and constitutional freedoms will not be met unless the next leader of Sudan is a reformist. He then declared a year-long nationwide state of emergency. The emergency state prohibited "unauthorised" gatherings and movements. Violence followed as the state deployed heavy-handed tactics to break up the protests. Al-Bashir also dissolved federal and state governments, replacing almost all of Sudan's 18 state governors with army officers. And he ordered parliament to delay deliberations over proposed constitutional amendments that would allow him to run for an extra-constitutional term in next year's elections. When the protests didn't subside he called for broad-based dialogue. In the final days before al-Bashir stepped down thousands of demonstrators reached the ministry compound in Khartoum. This also houses al-Bashir's residence, the secret service headquarters and the defence ministry. Protesters used a number of tactics to keep the momentum going. These included using social media such as Facebook, Twitter and WhatsApp. All evolved during the uprising despite the government's attempts to block the user, and Virtual Private Networks were used to access the women's only Facebook group called "Minbar Chat". Videos recorded by the protesters became important in documenting the crimes perpetrated by the security forces during the peaceful protests. They also became the main means of informing the Sudanese people and the international community about the brutality of al-Bashir's regime. Now that al-Bashir has resigned he will probably be required to leave the country by agreeing to safe passage to a friendly state, possibly somewhere like Egypt, or Qatar. The only way he can remain in Sudan is if he had prior agreement with the military to ensure his safety. It's possible that the new generals he appointed after the declaration of a state of emergency might side with him. Their support could have been one of the reasons why he felt that he could step down. Looking ahead, with or without Bashir, there's also a possibility that the protests could continue if the people of Sudan feel that the swamp has not been drained of all the regime's oppressive leaders.